Spend time with dolphins in their natural environment with the help of state of the art underwater breathing technology. 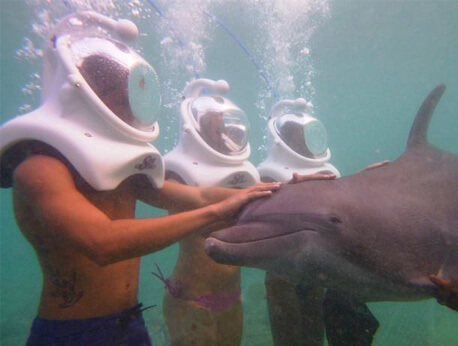 The Dolphin Trek at Dolphin Cayman is unlike any other dolphin swim in the world. You will be in their playground, under the clear Caribbean waters surrounding Grand Cayman, breathing comfortably whilst playing with dolphins. The Dolphin Trek at Dolphin Cayman is a truly unique experience where the participants get to spend time watching dolphins play while breathing underwater. Dolphins are not a strange sight to anyone who has been on the ocean in a boat but few get to see them strut their stuff under the waves. With the use of underwater breathing technology, you can see these amazing creatures in action. Without having to take any special courses or getting your SCUBA certification, you will have the opportunity to don state of the art breathing technology used by ship building societies all over the world. Once in the water, you will take a short, submerged walk to our viewing platform. Our dolphin trainers will help you adjust to the equipment and how to have the best possible experience with our dolphin friends. Our groups are limited to 10 people to maximize everyone’s experience. Though our equipment is safe, all participants must be able to breath and walk unaided on dry land first. All participants must fill out a medical questionnaire and liability disclaimer before any dolphin encounter. Please contact us first if you have a history of heart disease, strokes, or lung disease as any existing condition must be cleared by a physician before you can dive. All participants must be at least 12 years of age for the dolphin trek but we have a number of other encounters that are great for the entire family. For the safety of all our guests, remember to leave yourself at least 12 hours after consuming you last alcoholic beverage before diving, and give yourself 12 hours or more before flying. Please only wear biodegradable sunscreen to help protect our aquatic friends. Come enjoy this amazing and unique chance to see one of nature's masterpieces in its natural environment. Your friends will be calling you Jacques Cousteau before you know it.